Fear the Walking Dead begins season four with a much anticipated crossover. Morgan (Lennie James) becomes a primary character on the spin-off series. What's Your Story does not pick up after the dam explosion in Mexico. In fact, we don't see even see the Clarks until the very end of the episode. Fear the Walking Dead is going in a completely different direction. The premiere introduces new characters and explains how Morgan ends up with them. What's Your Story opens with John Dorie (Garret Dillahunt) in a field at night. He reads a romance novel by his truck while the fire burns. A sound startles him. He talks aloud into the dark. His name is John Dorie, not with a "y" like the cartoon. He hasn't spoken to anyone in a year. Suddenly a walker comes out of the brush. He shoots it in the head with crackerjack aim from his pistol, only to see Morgan was about to do him the favor. We flashback to the junkyard in Virginia. Morgan is at peace living by himself. He gets a knock at the entrance. Jesus (Tom Payne) is checking on him, wants him to come back. We hear another knock. Carol (Melissa McBride) has come to visit. She wants him to return to the Kingdom. Then we get another knock. This time it's Rick (Andrew Lincoln) beckoning his return. Rick tells him that he and the others wouldn't be alive if it weren't for him. Morgan doesn't want to hear it, but Rick tells him "you will be with people". There is no peace at the junkyard. Morgan packs up and leaves. Morgan walks along a desolate road. He hears voices again. He stops for the night, but gets up and keeps going. He finds a car filled with gas. Then we see the fuel empty as he abandons it. He finds another car. But leaves that behind as the front tire gets shredded. A montage follows of Morgan walking, day and night. It's obvious that he has gone a long way. Morgan finds an SUV with a man sleeping in the back. The man has an injured foot. Morgan attempts to leave bandages and alcohol, but the man doesn't want his help. He continues on. Now Morgan's shoes are taped up from walking. He lumbers along through the woods at night. He sees a walker walking towards a fire. As he goes to kill it, John Dorie shoots it instead. John offers Morgan food. It's been a long time since he's had company. He tells Morgan about a woman he's looking for, Laura. Morgan wants to leave, but John begs him to stay the night. As John sleeps in the front of his truck, Morgan quietly gathers his belongings and leaves. He walks along the road until he sees an abandoned tent. When he looks inside, he's knocked out from behind. Morgan awakens surrounded by men. He begs them to take his food, but let him take his backpack and leave. The men marvel at his fighting stick. A gunshot rings out and knocks the gun out of the leader's hand. John Dorie walks up with his pistol drawn. He's come to help his friend. The leader Leland, laughs, they have friends too. John is surrounded by others. Both men are sat down when a SWAT emblazoned armored vehicle drives up to the campsite. A woman with short hair, Al (Maggie Grace), is at the wheel. She heard the shots. She offers Leland's men a crate of noodles if they free John and Morgan. They initially refuse, but she turns a lever in the truck. A side panel drops to reveal mounted machine guns. Morgan and John are in the back of her truck. She introduces herself as Althea. She wants to know "their story". Al, in short, is a journalist. She drives them to a trailer park. She pulls out a camera and asks to record them. They owe her. John goes first. He tells her about his mission to find Laura, but doesn't go into further detail. Morgan is next, but he refuses. He leaves a tin of food, and then gathers his stuff. As he walks away, John catches up to give him a new pair of socks as a gift. Morgan notices that men are coming towards them. Leland's men raid the trailer park. They corner Morgan and John. Leland wants the keys to Al's armored vehicle. John makes a move against the attackers. His deadly aim takes a few down immediately. Morgan goes into Aikido mode against the others. Al throws away her keys. Leland goes after them, but is bitten by a rattlesnake. Bad guys on the roof have them under fire. Morgan climbs up and knocks the first man out. He gets shot in the leg by another rooftop attacker. He jumps to that roof and tosses the baddie over. Below a swarm of walkers tries to grab him. Morgan saves his life, but his kindness is not returned. The man attacks again and they fall through the roof into a group of walkers. 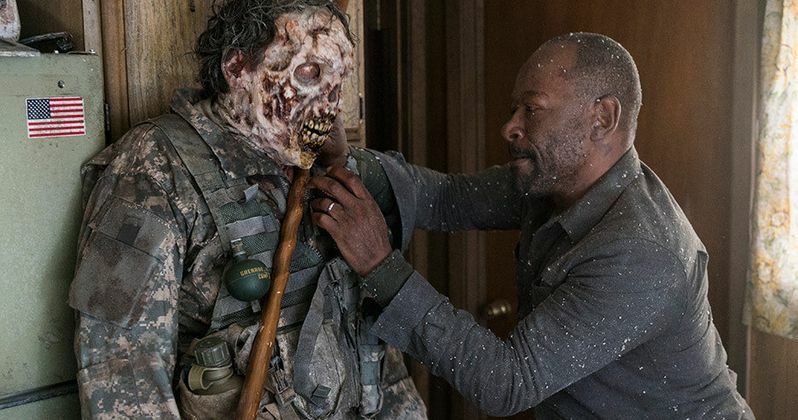 As the guy is chewed up, Morgan pulls a grenade pin on one of the walkers. He leaps into a bathtub as the room is blown up. Leland has found the keys, but they're for Al's locker. She races around the passenger side. As Leland goes after her, he is shot by John. Morgan and John are now surrounded by walkers. She yells to get down as she unloads her rigged machine guns. The walkers are mowed down like grass. Back in the truck, John notices a white flag with "51" on it. There was a similar flag flying at the trailer park. Al has no idea what they mean. She demands an interview with Morgan. In camera frame, she asks where Morgan came from. He tells her Atlanta, then Virginia. He talks about how he came from a good group of people. They were at war with a bigger group, but prevailed. He tells her about the Kingdom's Ezekiel and his pet tiger. Al asks why he didn't stay with them. Morgan replies that he "loses people and himself". He gathers his belongings and takes off again. Morgan is limping down a long road. His wound is bandaged, but he can barely move. He comes across the same SUV from earlier in the episode. The door is open, in the distance a walker hobbles. He starts to follow it, but is set upon by walkers by the side of the road. Morgan falls down. As the walkers approach, they are shot by John. John helps Morgan catch up to the hobbled walker. It was the man he offered to help. Morgan kills him. Al and John watch as Morgan buries the man's body. They drive off again. Morgan decides he will stay with them until his leg heals. Al will help them look for Laura. They drive until they see a lone woman walking in the middle of the road. Al grabs her rifle to investigate. Morgan informs her that "he doesn't kill". John agrees, and then says he tries not to. Al approaches the woman slowly, asking if she's injured. Suddenly the woman lunges and puts a knife to her neck. It's Alicia (Alycia Debnam-Carey); she says "there are bad people here". Nick (Frank Dillane), Victor (Colman Domingo), and Luciana (Danay Garcia) pop out of the grass with machine guns. Morgan and John drop their weapons. Morgan's crossover had been publicized for weeks. The draw was what circumstance would facilitate his appearance on Fear the Walking Dead. It seems we have jumped forward in time for the original cast. Morgan leaves Alexandria after Rick's group defeats Negan. This has to be a good while after the Clark's detonated the dam in Mexico. "51" must refer to the community in Houston that Alicia was told about last season. Madison and Salazar were not with them on the road. Now that the show's introduced Althea, the quick draw John, and Morgan, Fear the Walking Dead has some new blood to invigorate the series. Tune in next week to AMC to find out how the Clarks ended up in Texas.